I got invited to the reopening of the Rain Lounge and Club in the upscale Banjara Hills neighborhood of Hyderabad. Located on the rooftop of the Shangrila Building it had a great lighting and ambiance. Praveen the manager persuaded me to try a unique cocktail " Betelnut Martini" . 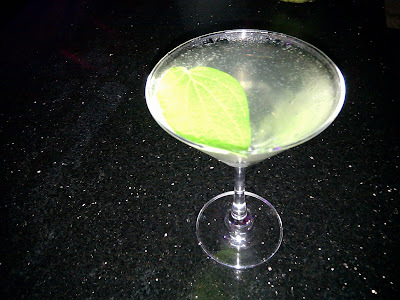 and also tasted the Cucumber Margarhita . I really liked the Betelnut Martini and had some great snacks. The Masala peanuts are my favorite. The crowd was akin to any lounge that I have been to in a US city - very hip and coll dressers and having a great relaxing Saturday evening.The lighting and sound was great and music choice very familiar. I left early so did not wait for the party to get hotter . Nice to have valet parking .